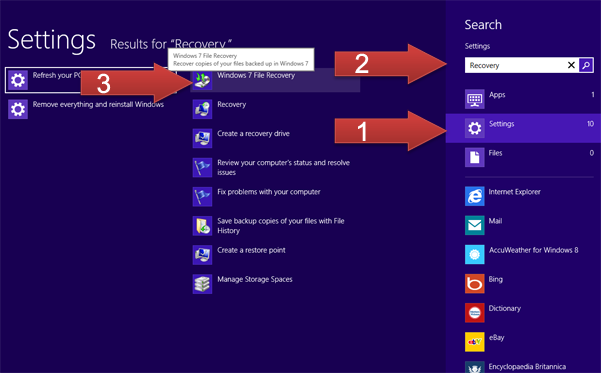 Why Creating Windows 8 Repair / Recovery Disks Is Now A Must! Have you made your Windows 8 repair / recovery disks yet? If not, here is why it is in your best interest to create recovery disks for your Windows 8 computer. One of Windows 8’s noticeable changes is that Windows 8 computers no longer come with a product key sticker. If you upgraded to Windows 8 by getting a disk, then no worries, you should have a product key. All you have to do is keep it safe. If you upgraded from a download, be sure to print out your product key and keep it safe. However, if you bought a Windows 8 computer you will want to create a system image (Backup copy) of your Windows 8. Here is why: Without a system image, the price of repairing your computer can easily go up about $100 plus, if the repairs require reinstalling Windows 8. 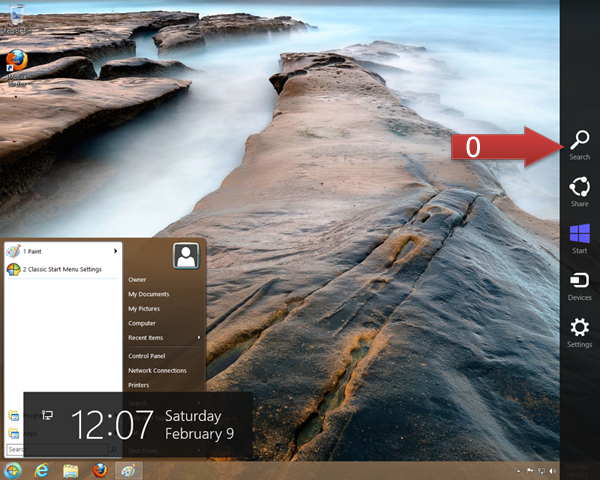 Creating a system image secures both your Windows 8 operating system and the product key that comes with it. Without a system image, Windows 8 users will be left with only 2 options; either purchasing a new copy of Windows 8 or getting a new computer altogether. Heaven forbid a nasty computer virus or hard drive failure puts you in a position where you will need to reinstall Windows 8. If you have a system image or recovery disks, the cost repairs can be reasonable. If not, well, you get the idea. This can all be prevented by taking time to make some repair/recovery disks for your Windows 8 computer. Assuming that you feel comfortable navigating your Windows 8 computer, creating system image disks is fairly easy. First, you will want to get some DVD disks if you don’t have any. You can use the regular 4.7 GB DVD+R or the DVD+R DL (dual layer) for extra memory space, thus fewer disks. The later happens to be my preference. Load a blank DVD disk into the optical disk drive. Move the mouse to the top right of the screen to activate the Charms bar and left click on the Search feature of the Charms bar. See image below. Once in the Search feature options, select the Settings option by left clicking on it and then start typing “recovery” inside the search box. A list of options will be presented to you. 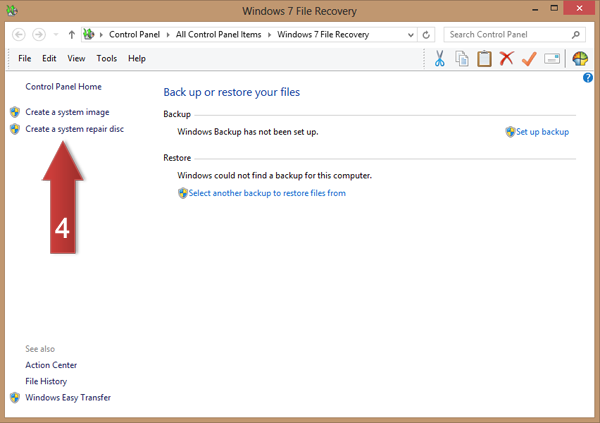 Now, select the Windows 7 File Recovery option. It sounds strange I know, but that is the option that will work. The next screen will be the Windows 7 File Recovery screen. Here you can choose to create a System Image or a System Repair Disk. This is where the magic happens! This is where you can create a Windows 8 repair disk and some system image disks. Yes, this will create a system image of your Windows 8 even though it says Windows 7 File Recovery. It should be a walk in the park from here on out especially if you have used this feature in Windows 7. Just follow the prompts, label and change the disks when you are prompted to and you will be done before you know it. I strongly recommend that you create both the system image and the system repair disk. It is best to create your Windows 8 repair disks before loading any of your personal data so that you will not need to use a ton of DVDs. You can always setup a backup of your data files separately. However, if you have already loaded your data on the computer, it’s still better to have a ton of backup DVDs than nothing. We hope you’ve found this information useful and valuable enough to share.